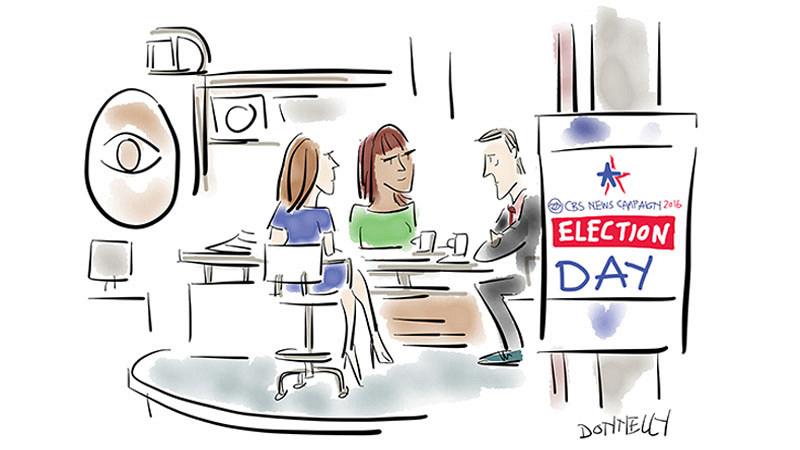 Behind-The-Scenes With CBS This Morning's Cartoonist Liza Donnelly adds her vision and fresh storytelling to CBS This Morning's new media with live drawings. and Get 2nd Year FREE! Three years ago, when political cartoonist Liza Donnelly started doodling on her new iPad, she inadvertently revolutionized her work. A contributor to The New Yorker since 1979, when she sold the magazine her first piece soon after college, Donnelly began rendering what she calls "live drawings," depicting current events as they develop. Fast-forward through a few administrations to October 2016, when the fledgling news show CBS This Morning was looking for a fresh way to create buzz on the air and on social media. "We're a 5-year-old show competing against some legacy [morning-show] brands," executive producer Ryan Kadro says. Donnelly's work, he says, caught the eye of the show's social media producer, Kevin Prince, who pitched the idea of collaboration. "The idea was out of the box for a news brand, but it was exactly the kind of smart, different thinking a show needs," Kadro says. Donnelly started incorporating her fresh form of storytelling with the CBS News team's coverage of the Democratic National Convention in Philadelphia last July, then took a permanent place on the morning show in October. Complementing the on-air reporting from Norah O’Donnell, Gayle King, and Charlie Rose, Donnelly uses a few well-chosen lines—which can be electronically erased and redrawn to perfection—to capture the spirit of an interview, then has the image on the air and in Twitter and Instagram feeds within moments. These live drawings have elements of other art forms (such as caricatures and courtroom sketches), but Donnelly is free to add her editorial perspective. "The drawings are different from a cartoon, because they're not so much a crafted idea or a political thought but instead my response to the visual I'm actually seeing," she says. The relationship between artist and show has been mutually beneficial: The network provides Donnelly an extensive reach to showcase her work, and Donnelly gives CBS This Morning a new tool to connect its broadcast presence to social media and to boost engagement with the CBS News brand. On a slow news Saturday, Kadro says, Donnelly's work helps keep the weekday show on viewers' minds. And the morning after a big event, such as the presidential inauguration or the Super Bowl, "when everyone is looking at the same pictures and video of this thing 60 million people watched, it becomes a powerful differentiator for our show to be able to offer a different view of that same moment." 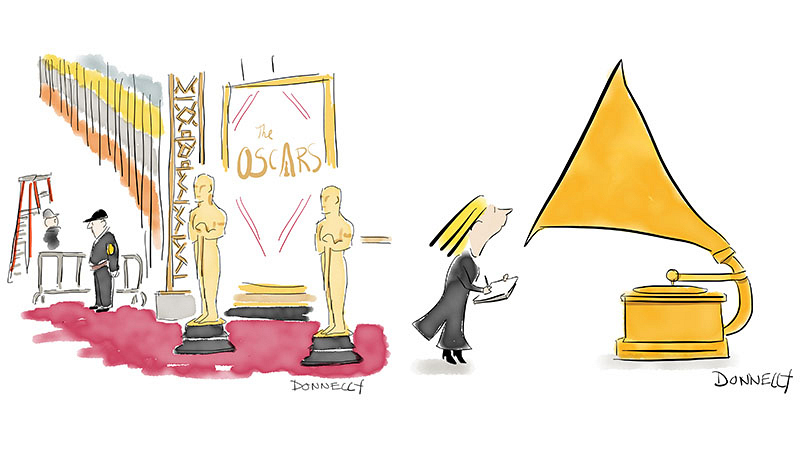 "I've been putting a lot of cartoons out there, but it's these live drawings that are really speaking to people for some reason," Donnelly says. "People tell me they look forward to them online, and that's really rewarding." By Jim Colucci | Originally published in Watch! Magazine, July-August 2017. Photo Credit: Michael Crowe/CBS. Illustrations: Liza Donnelly. CBS This Morning and CBS This Morning: Saturday air Monday through Saturday at 7 a.m. ET/PT on CBS and CBS All Access. As the official magazine of CBS, Watch! offers a rare, glamorous window into the lives of television's biggest stars. With distinctive photography by top tier talent and first class stories curated by industry veterans, Watch! has become one of the most elegant, sophisticated publications steadily growing today. This intriguing amalgam of celebrity, culture, fashion, travel, and beauty reaches one million readers across the country with entertaining interviews and images featuring talent from CBS, Showtime, The CW, CBS All Access, Simon & Schuster, CBS Films, Pop TV, and beyond. The magazine's digital properties present readers with richer pathways to continue the journey beyond the velvet rope. Timely, behind-the-scenes videos and photo galleries bring the reader closer to their favorite characters and their favorite shows. The digital version of Watch! can be found at cbswatchmagazine.com as well as on a variety of platforms, including Zinio, Magzter, and Apple News. The bi-monthly print magazine is enjoyed by subscribers and sold on newsstands at Barnes & Noble, Hudson News, Target, and Walmart. By viewing our video content you are accepting the terms of our Video Services Policy. © 2017 CBS Interactive. All rights reserved.